Well before I get stuck into this post properly I have to announce that I have reached .and missed my 100th post...... because it was last Sunday! I know traditionally this calls for a give-away and it will come but you guys have to hang in there until the end of the month...but I promise will be worth it. You may remember a post some weeks ago (here) where I spoke about a new commission I was given by friends of mine, Claire and Mica. 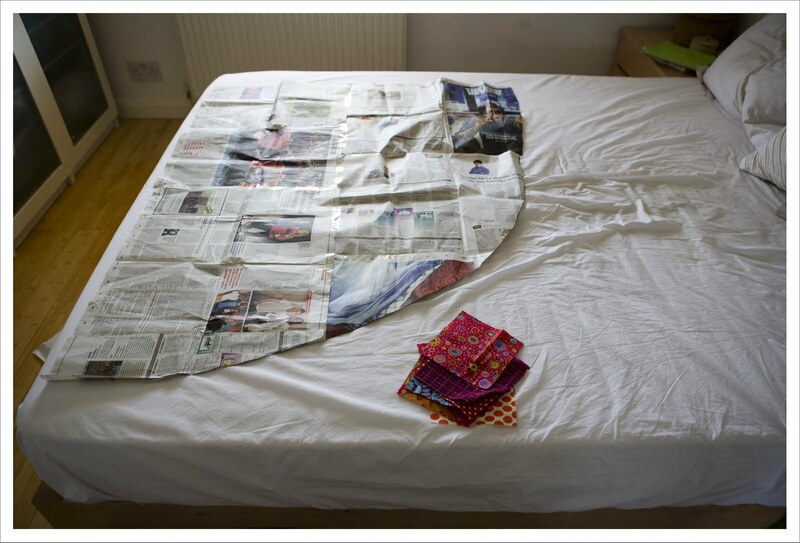 Their brief was to make them a quilt that is large enough to snuggle up under AND to cover up their ugly sofa. 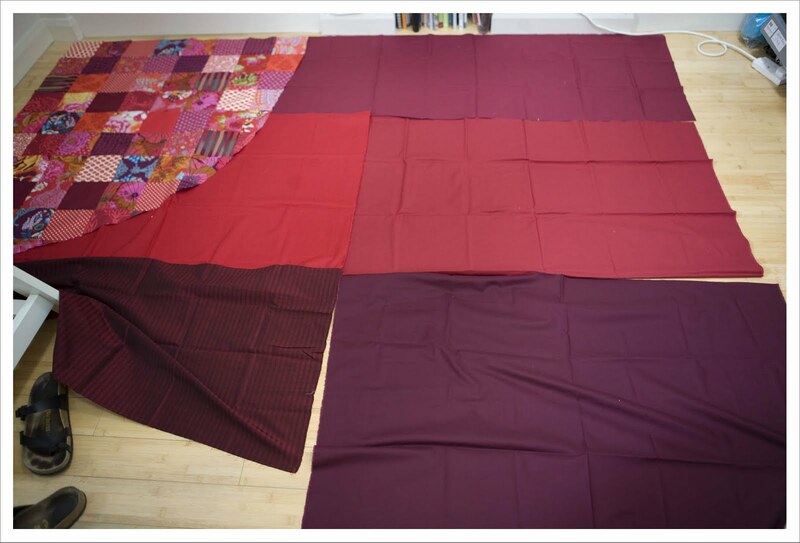 The sofa is unfortunatley of the VERY large size hence the quilt is going to be 2.5 x 3.2 m that is 98 x 126 inches. In other words a monster size quilt. 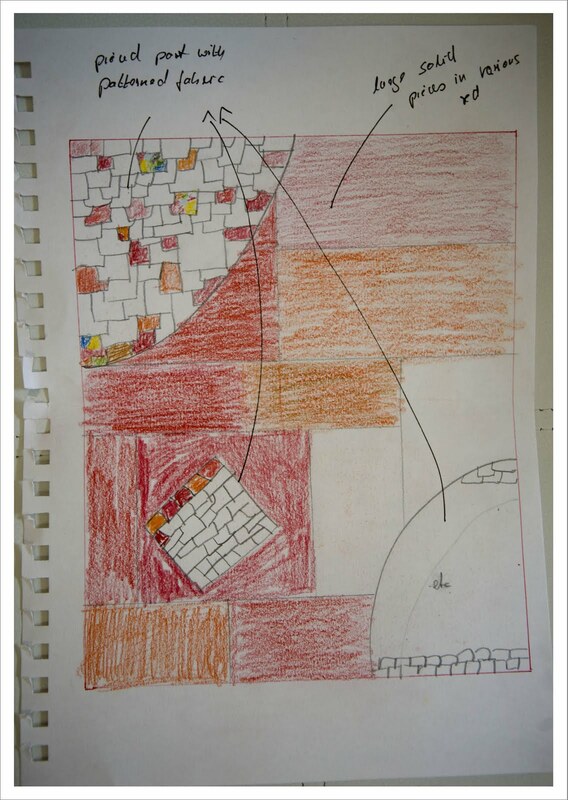 I collaborated on the design with Claire and we came up with a minialist design that has large areas of solids and some areas that burst with colour and pattern. 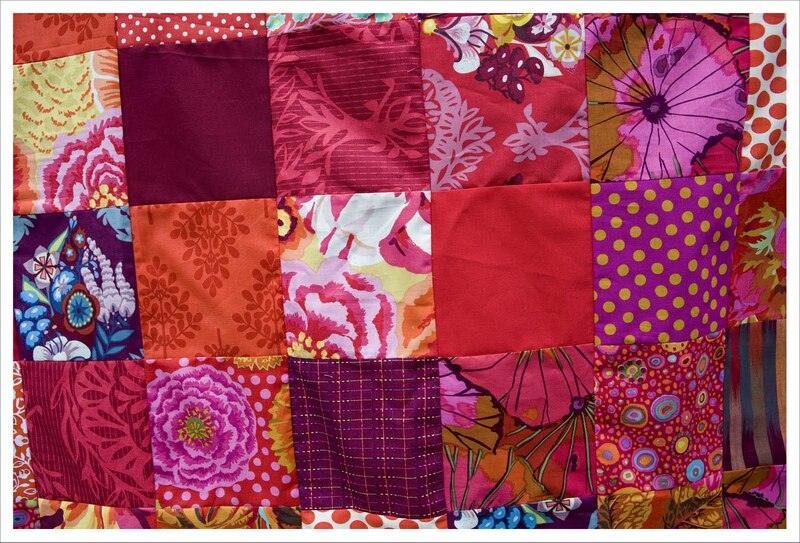 Claire wants this quilt to be dominated by a variety of reds. 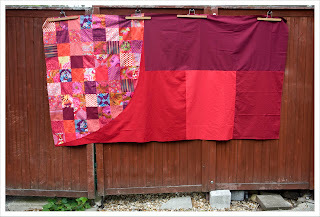 We picked the colours using my Kona colour card and because the reds remind me of berries, I named the quilt "Very Berry". And now that fabric and name are chosen there really is no time to waste anymore. Over the coming weeks I am going to report regularly on the progress to show you how this venture goes (or not !!) 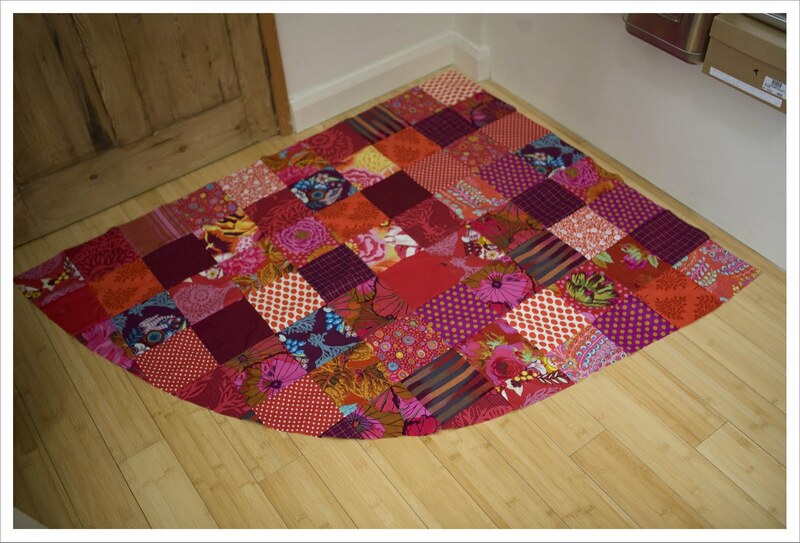 as this is the largest quilt I have ever attempted. And upfront I have got to apologize for the somewhat bad quality of the photos. Red as is almost as difficult to photograph as white which is why the same red will appear different in as many pictures. Last week I started to pull out patterned fabrics to start the left corner area. I am keeping the design of the corners simple as I am concious of the amount of colour in this quilt. 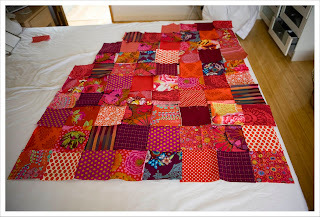 I think an elaborate quilt pattern would overburden the quilt. 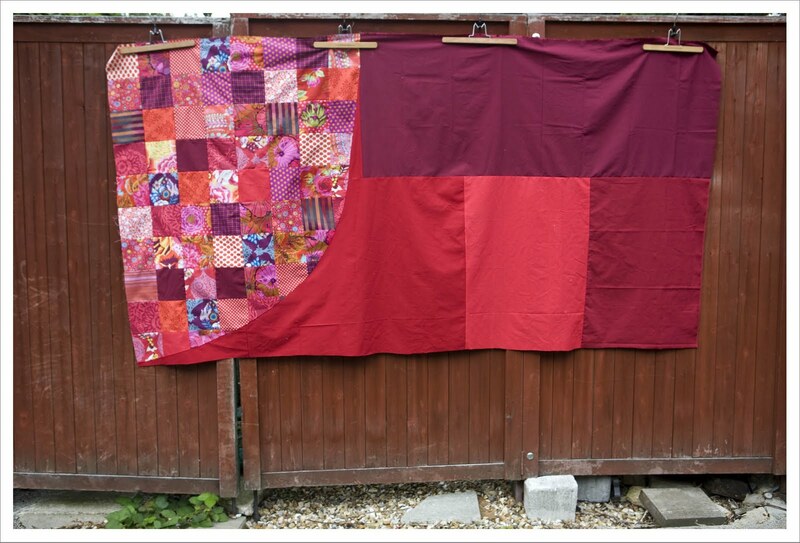 I also included some fabric with lighter areas to balance against the large amount of dark reds. I added texture by using some K.F shot cottons and some trusted Oakshott. I cut out 5 1/2 inch squares and lay them out on the floor of my studio but quickly realised that I should be doing this on top of a template because of the curve I am cutting along the right edge. So I took an old newspaper, taped together a rectangle of 40 x 50 inches and cut out the curve I wanted for this shape; this left me with two templates (basically the positive and negative part of the curve). I then proceeded to lay out the squares again on top of the template (and the bed as one doesn't have to bend down quite as low.....) until I had a layout with which I was happy. 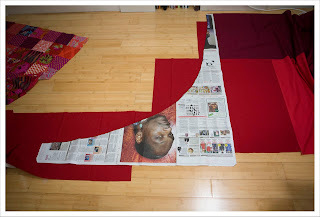 I sewed all squares together (to what is essentially the size of a baby quilt) and cut the curve along the newspaper template. Now we are back on the floor as I had to start to assemble the large blocks of solids. I moved them around and around a bit more until I was pleased with the arrangement once again. 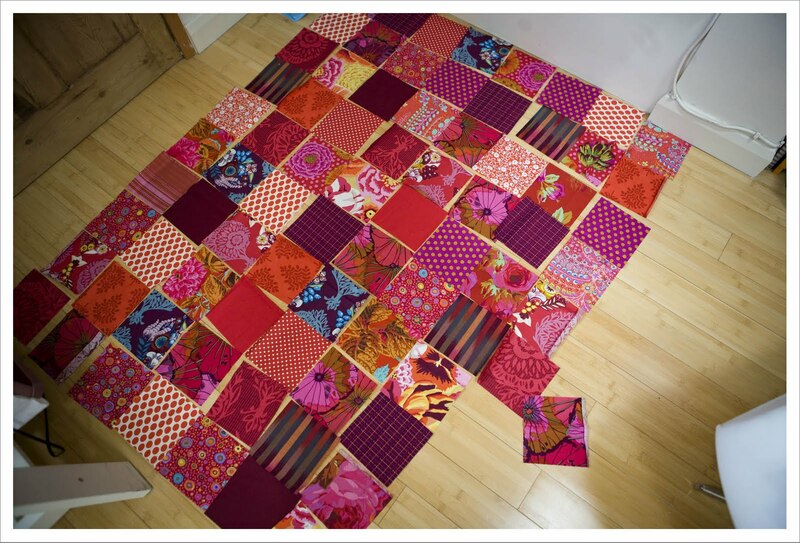 And here is the finished part of that weekends work - 1/3 of the quilt is done. To complete the picture you have to imagine another middle part of solids with a small pieced patterned part and basically another part like this but turned around (with a patterned right corner). I was really apprehensive about sewing and cutting such a large curve but I must say it was a breeze and the seams are flat as a pancake but I think that is entirely down to using a paper template and Snoop Dog obviously. Close-up of the vibrant corner part. Wow! Those colours and shapes! This is going to be out-of-this-world amazing when it's done! oooh this is going to be so good! Love the patterned corner, and I'm impressed with the way you got it done too :-) I know I'm going to love seeing this one come together! 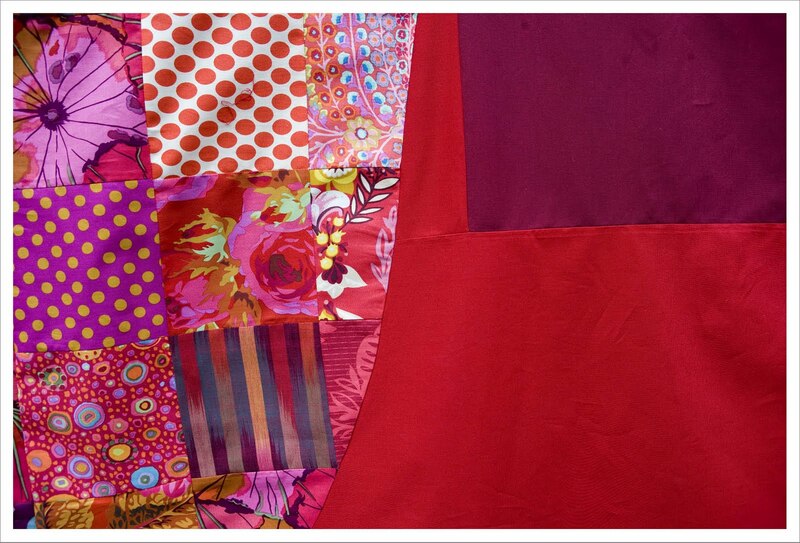 That Snoop is a marvel in the quilt room! Looking awesome! 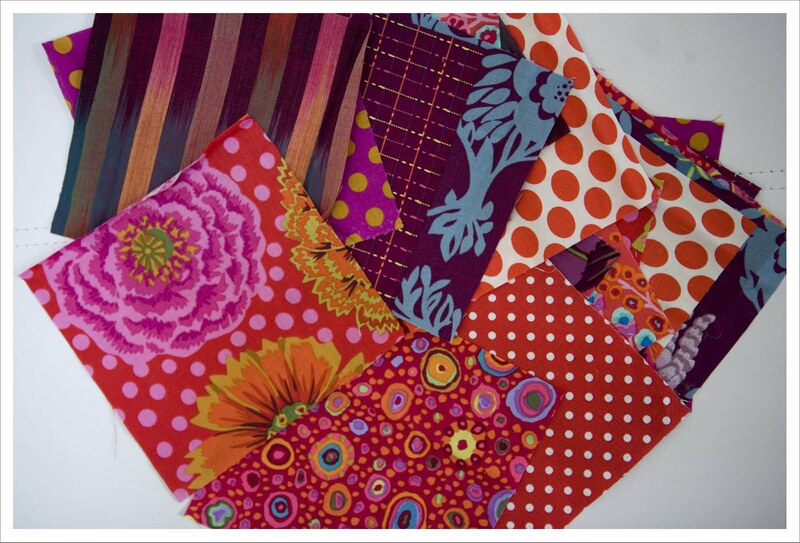 I love your vibrant patterned corner - the fabrics are lovely! This is looking gorgeous, I can't wait to see the end result!